Painfully close to TWO YEARS ago, I did a post about buying an Accuquilt machine and that I had cut the pieces for a tumbler quilt for my daughter. Today, I actually finished the quilt top, and I'm calling it a success for two reasons. One, is that I consider this my second finish for 2013 (because I'm not going to quilt it, someone else is) and two, because it's a UFO. Finishing up started and abandoned projects is one of my top two goals for this year. I got a bunch of red, black and white fat quarters while I was doing a shop hop a few years ago to match the dalmation minky that Ally picked out. It's a nice lap size about 36" by 48". 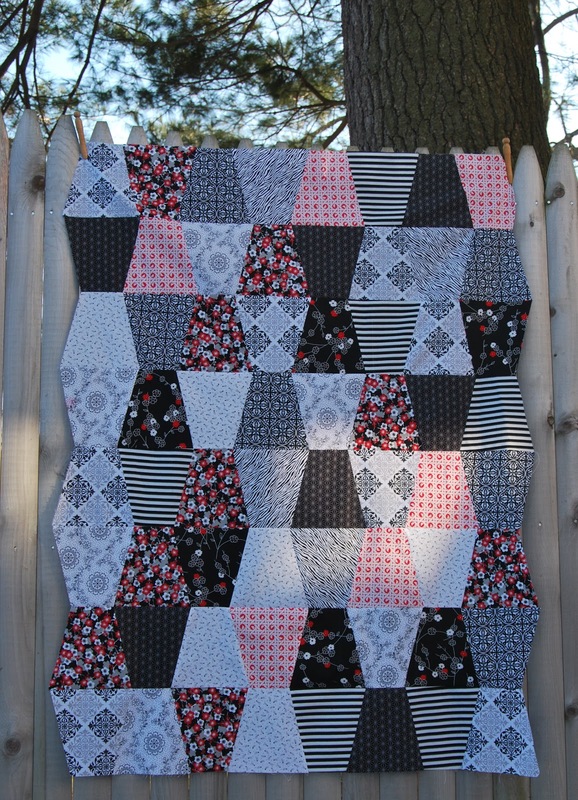 Finishing up UFOs goes a lonnnng way in relieving my guilt when I start spur-of-the-moment projects like the scrappy trip along quilt. I have two blocks of the 16 done so far, and two more laid out and ready to sew. I can't wait to share that one.